With one of the best coffee pod machines on the market today perfecting your espresso making skills could be a thing of the past! Unlike the typical coffee machine, the pod coffee maker is simpler to operate as the coffee beans are already grounded and measured to make the perfect cup of espresso. thus, skipping on the task of grinding and tamping the beans. The finely-grounded beans are then packed inside hermetically-sealed airtight pods, capsules or pouches, which will then be inserted into the proper slot of the espresso machine. The reservoir is filled with water, which is then heated to the proper temperature to make the espresso. In most machines, the entire process takes just a couple of minutes from the insertion of the pods into the filter to the full brewing of the espresso ready for enjoyment. On some of the best makes you can get coffee in under 15 seconds! Add in the ease of cleaning the pod espresso machine and coffee lovers have every reason to purchase it. 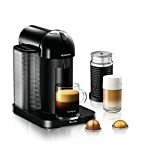 Rated at 4.5 stars on Amazon the Nespresso CitiZ automatic and the more recent Nespresso Vertuo espresso machines offer a strong retro design, with an extraordinarily efficient and user-friendly performance. We actually own a CityZ and my wife loves it. For her she wants something that’s quick and simple to use and I have to admit it does make a decent coffee. She isn’t getting a full authentic espresso making experience like on a Barista Express but the fact that Nespresso has the best selection of blends means she can still have fun changing things up a little. This is probably the best pod coffee maker, it doesn’t just function as a stunning feature in any home, but it also brews up de-stressing, cafe style espresso beverages easily and quickly. 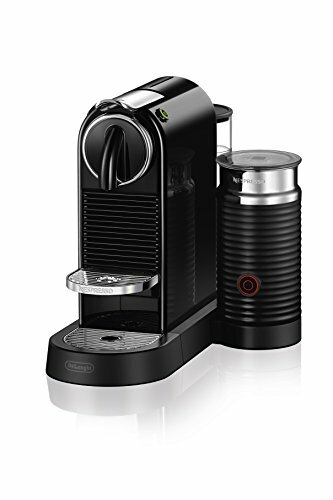 The appliance comes with a one of a kind extraction process created specifically for coffee pods, which helps to provide perfect espresso each and every time. The coffee pod machine perforates the hermetically sealed capsule and soaks your coffee, whilst the high pressure 19-bar pump extracts aromas and provides body to the espresso, making sure the dense and creamy crema sits over the top. On top of that, there’s a built-in Aeroccino to get a continuous selection of milk based espresso beverages. The flow of coffee is dependent upon your coffee selection, and up to eleven used pods gather inside the capsule compartment for disposal at your leisure. Other considerate features consist of a programmable volume control, an economical setting, a one litre extractible water container, a detachable drip-tray, as well as foldable cup-support. The Nespresso Lattissima espresso machine is manufactured by the well-respected player in the industry, DeLonghi. Such is its simplicity of operation that the Lattisima can be used to manufacture several types of coffee beverages at just the simple touch of the button. 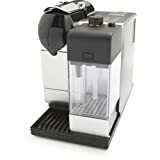 With espresso as the base beverage, coffee lovers can enjoy the flavors of cappuccinos and lattes with this single coffee maker alone – just slide the milk tank into place and enjoy these equally delicious coffee beverages. Also, the Nespresso Lattissima allows for customized amounts of frothed/steamed milk to suit individual preferences. After using the milk container, remove it from the machine and then store the leftovers in the refrigerator for later use. Or push the clean button to automatically clean the container. This coffee pod machine can also be cleaned easily since the used capsules are automatically ejected immediately after the brewing cycle is completed. The Lattissima is also well-loved for its capability to prepare cups of espresso one after the other because of the double boiler system. Again, just place the capsule into the filter, push the button and the machine will do the rest of the work. Basically, water soaks the ground coffee beans while the 19-bar high-pressure pump extracts the aromas, flavors and body of the beans to create delicious espresso within a couple of minutes. It probably wont be a surprise to many that we include one of Keurigs flagship models in our list of coffee pod machines. At a price just under $200, the Keurig K575 hits the sweet spot as a coffee capsule machine for the home. It’s not over-priced, but it’s also not lacking in features, which makes it well worth the cost, as confirmed by its rating as the #1 Best Seller among single serve brewers on Amazon. With a large, 80 oz. water reservoir, it can brew up to 10 cups or as few as one. It’s also highly customizable. Strength control settings allow you to brew a bolder cup of coffee and its five different temperature settings and hot water on demand mean you can have it as steamy as you like. The extra-large touchscreen also makes controls easy to use and programming a breeze. We regard the Keurig K575 as the best single serve coffee maker under $150. Cuisinart is a name that homeowners have trusted for decades, so of course, their best single cup coffee maker would make it onto our list. Before diving into the specs, the first thing you’ll notice about the Cuisinart SS-10 it’s sleek, modern design. With brushed stainless steel, and illuminated buttons and controls, it’s a machine that compliments any countertop. But, looks aren’t everything. The large, 72 oz. water reservoir means it requires fewer refills than smaller capacity machines and features 5 brew sizes. Whatever size you choose, it’s done quick and brews in less than a minute with no heat-up time. Furthermore, the charcoal water filter located inside the machine makes for the best tasting coffee possible, every time. Gaggia 14101 Classic – Can Use Grounds and Pods! Coffee lovers also love it that this Gaggia Classic Espresso Machine can be used in both the traditional way where the coffee beans are grounded before tamping and brewing as well as the modern way using the pods. An espresso machine with commercial capabilities, the Gaggia 14101 Classic has all the hallmarks of a high-quality product and features highly on our list of the home espresso machines. Its housing is made from stainless steel while its portafilters are of brass, which means greater durability and functionality while also attesting to its elegant style. Other commercial-grade features include the powerful 17 1/2-bar pump complemented by the high-voltage boiler to make espresso quickly; a three-way solenoid valve to provide immediate pressure release; and a frothing wand for crema, among others. Indeed, all of these coffee pod machines are great ways to prepare espresso, latte, and cappuccino in the comfort of your home. If there is a kitchen appliance that will become your favorite, then it will be the pod coffee maker. Lets take a look at more of the best single cup coffee makers.